On February 1 and 2, 2011, Chicago experienced the third-heaviest recorded snowfall in its history. Rush staff members mobilized to maintain excellent patient care in the medical center. Rush University Medical Center created a sleeping and rest station in the Searle Conference Center for staff, students, and volunteers who opted to stay on campus, and many of the hospital’s services continued without interruption. This is not the first time that our campus has faced such an imposing storm. 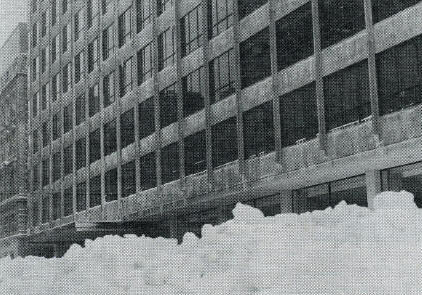 Fourty-four years ago, the worst blizzard in Chicago history paralyzed the campus of Rush (then known as Presbyterian-St. Luke’s Hospital). Unlike the recent blizzard, this storm arrived almost entirely as a surprise. From Jan. 26 to 27, 23 inches of snow fell. Since the city was unprepared for the onslaught, transportation was mostly paralyzed for days. The Chicago Tribune reported over 50,000 cars and 800 CTA buses were abandoned in city streets. The consequence for our campus was that most of the workforce was unable to travel into or out of campus. Employees rested in lounges and in the nursing school housing on campus. Because the streets were mostly impassible, the hospital landed a helicopter on the Paulina overpass to deliver a pacemaker. The February 1967 issue of NewsRounds included photos and viewpoints from a variety of staff members. Rush would like to collect your stories about Rush and the blizzard of 2011. We invite all members of the Rush community to post printed photos and stories on a banner that will be hung in the cafeteria between Tuesday, Feb. 15 and Friday, Feb. 18. The Rush Archives will collect these documents for its permanent record of Rush’s response during the storm. If you are unable to participate in this display, but you would like to share your story with the Rush Archives, please email us at Rush_Archives@rush.edu. We will collect all of the employees offered by staff, volunteers, students, and patients, and we will maintain them as a collection documenting our institution’s extraordinary work during this storm. “We would also like to thank everyone who has gone out of their way to ensure that our patients continue to receive excellent care during this weather crisis. Many nurses, doctors, other caregivers have come to Rush in advance of their shift or stayed overnight at Rush to ensure adequate staffing. Non-clinical people too — from medical center engineering to food services to transport to name a few services — have made extraordinary efforts to get into Rush and to provide the support services required for our patient care activities. We are writing to share our immense gratitude to the Rush community for your outstanding response during this week’s blizzard. Thanks to the many people who went above and beyond the call of duty, ensuring that our patients continued to receive excellent care during and after the storm. Despite the severe weather that made travel hazardous and extremely difficult, employees, volunteers and faculty came by foot, car, train and bus from as far away as the outlying suburbs, often arriving at work early, to make sure we had adequate staffing to care for our patients. About 80 employees even arrived by ambulance, thanks to our ambulance service, which picked them up and brought them to the Medical Center. Co-workers who live near Rush put up colleagues overnight, and other employees stayed in nearby hotels or bunked down in the makeshift dormitory in the Searle Conference Center. Rush University students helped cover areas that were short-handed. Many of you temporarily took on new roles, transporting patients, serving meals and cleaning rooms. The leadership of the Hospital Incident Command Structure made sure we were prepared for the storm and guided us through it. As a result of your extraordinary efforts, patient care continued as usual: Surgeries took place, babies were delivered and patients were cared for in countless ways throughout the Medical Center. In addition to maintaining our clinical services, the sidewalks and entrances were cleared, repairs were made, patient rooms were cleaned, supplies reached caregivers and patients and staff were fed. It is inspiring to see such dedicated, devoted and selfless employees, students, faculty and volunteers in action. You truly embody what Rush is about — putting our patients first and foremost and making sure they receive the best possible care.